Break or cut the cauliflower into florets. In a large bowl, whisk together the flour, buttermilk, garlic powder and salt. Whisk until mostly smooth. 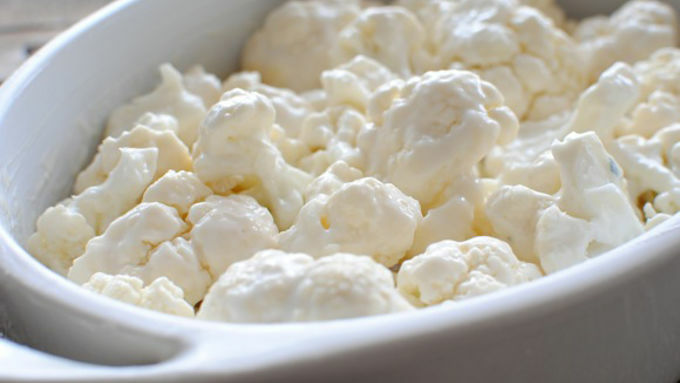 Gently add the cauliflower florets to the bowl and toss to combine. Transfer to a baking dish and bake for 18 minutes. Check at the 15-minute mark. 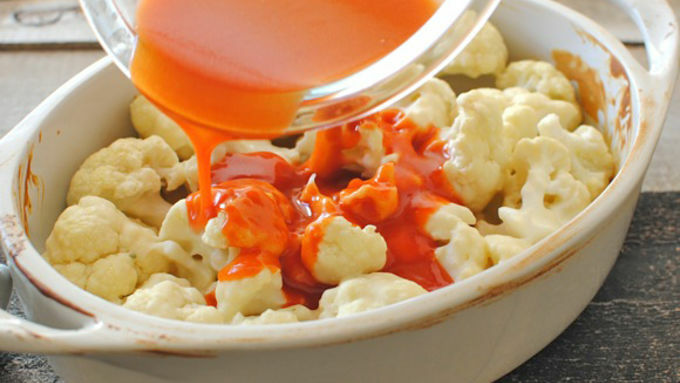 In a different bowl, whisk together the melted butter and buffalo sauce. 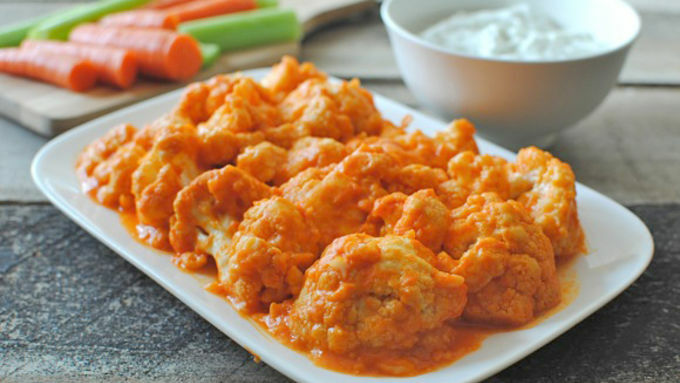 Once the cauliflower is baked, pour the buffalo sauce over the cauliflower and lightly toss to coat. Stick back in the oven for 5 to 8 minutes. 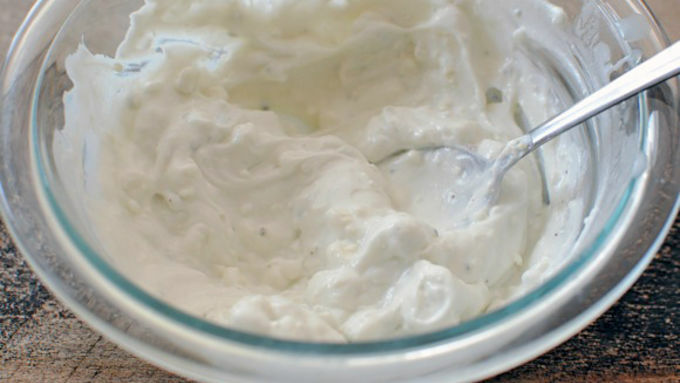 In the meantime, in a small bowl, whisk together the yogurt and blue cheese. Add a tablespoon of water to thin it out, if needed. Season with a small pinch of salt and pepper. 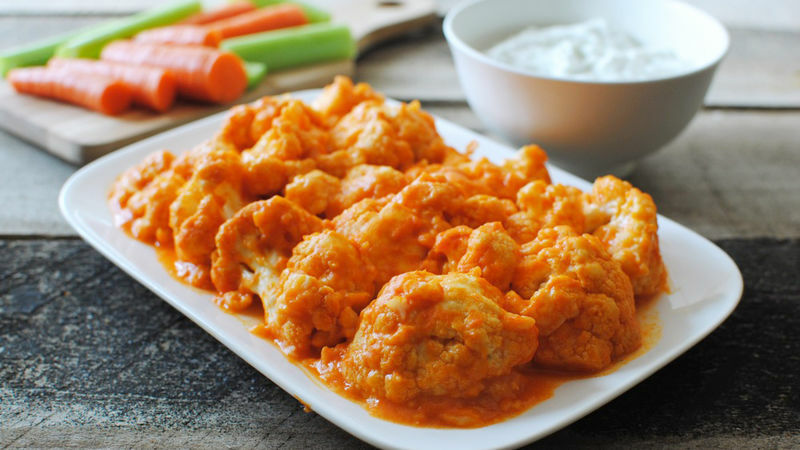 Serve buffalo cauliflower with blue cheese dip and sliced carrot and celery sticks! I'm sorry, but I would pretty much lick a shoe if it was covered in buffalo sauce. But since that's most likely "frowned upon" by most normal human folk beings, we'll go with cauliflower. Have ya ever thought about subbing the word cauli for cauliflower and chicky for chicken? Have ya ever thought about subbing the cauli for the chicky? Have ya ever thought about punching me in the face? You know what, game day is here and we have no time to waste. We have buffalo to lick! Just serve it with the blue cheese/yogurt dressing and a mound of carrots and celery! Better make a double batch.